Food tours are a really fun way to get a taste of a city in a short period of time. They are a great way of learning about local cuisine and making new friends, so I obviously when I went to Las Vegas, I wanted to try one, I wanted to know more about locally-loved places that not only serve up delicious food, but also carefully fit into the Downtown Las Vegas‘ remarkable story. We met our lovely guide, Vickie from Valley Vegas Tours, at the Art Bar at the Grand Hotel. After exchanging pleasantries she led us to our first stop, inside the Grand Hotel – Freedom Beat. 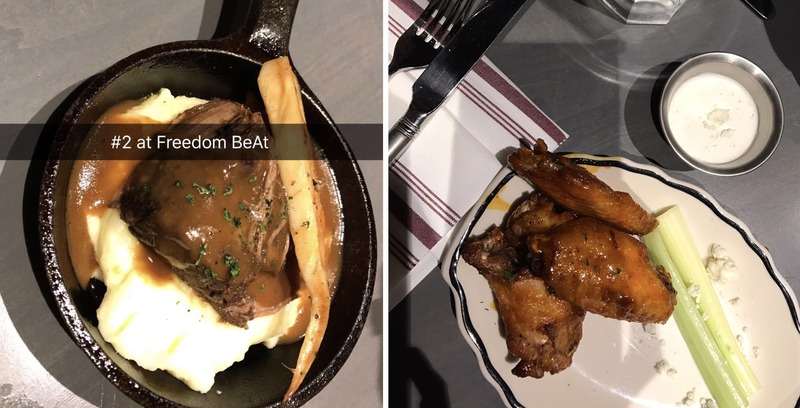 The Freedom Beat is an attraction for food and music lovers, their menu was created by Chef Scott Commings (Hell’s Kitchen Season 12 Winner). I loved their chicken wings! While walking to our next destination, Vickie shared a brief overview of Gold Spike where they have live music, scrumptious food and interactive (over-sized) games. Their backyard is a family-friendly hangout spot during the day and it transforms into an energetic nightlife venue. Stop #2 was a bit of a walk, and by this time we were getting to know a bit more about the group as we shared travel and life experiences. We entered Rachel’s Kitchen,known for their fresh, high quality and delicious food with a gourmet touch at very affordable prices. We had a taste of their Berry refreshing smoothie, a delicious salad & pasta. On the way to our next stop, Vickie pointed out the Emergency Arts studios on Fremont street. We finally reached the Donut Bar and there was a long queue inside, so if you plan on stopping here, especially during the weekend – keep that in mind. San Diego cult favorite Donut Bar Las Vegas opened their doors in Las Vegas in 2015, since then they have been some amazing creative varieties like their vermont maple cinnamon roll, maple bacon, caramel latte, mud pie, blood orange, root beer float, cake batter and spiced chai. I tried their infamous French toast ? and it did not disappoint. Now I understand why they are the best Donut store in USA. Our 4th stop was Zydeco Po-Boys, they offer Louisiana favorites in the heart of downtown Las Vegas. I loved their rice and beans which had a really unique smokey taste. While I was enjoying our time with Vickie, who truly could not have been more gracious or lovely, this could have been the last eating stop on the tour for me. The food was filling, and the portions had been quite generous! We headed to the Container Park, which was so charming with vendors and cozy street cafes. 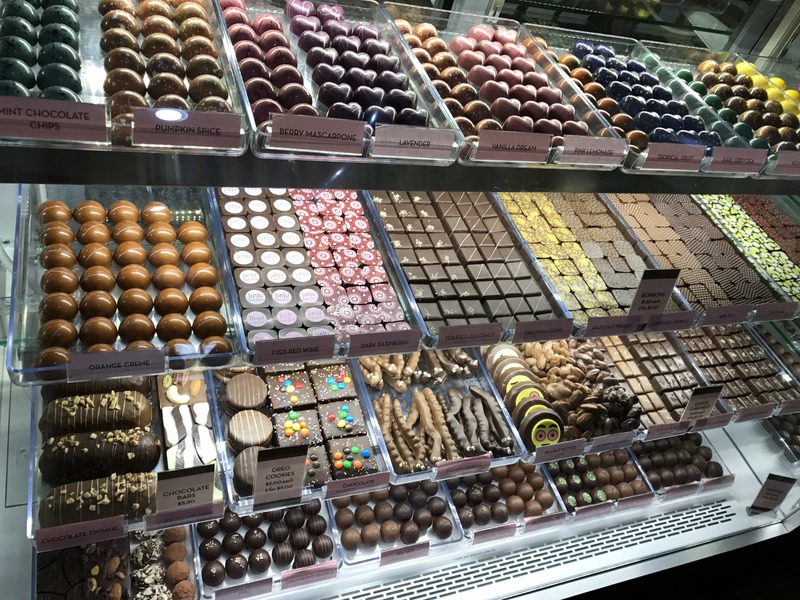 JinJu Chocolates – Winner “Best of Las Vegas” 2015 & 2016 is a really unique chocolatier serving all natural, artisan chocolates with a modern twist. We sampled a few pieces of their chocolates then we went inside the Sweet Spot Candy Shop for a soda. Downtown Las Vegas is a neighbourhood is like no other. It’s tapestry of unique architecture, diverse cultures, mouth-watering cuisines and fascinating stories make it an ideal destination for a walking food tour. Disclosure: I was a guest of Valley Vegas Tours. However, all views, opinions and subsequent indigestion are my own. I highly recommend this experience as a high-end, extremely well put together food tour. How much was the tour? Oh wow. That is a lot of food.